The synchronized groundstate, from the video. 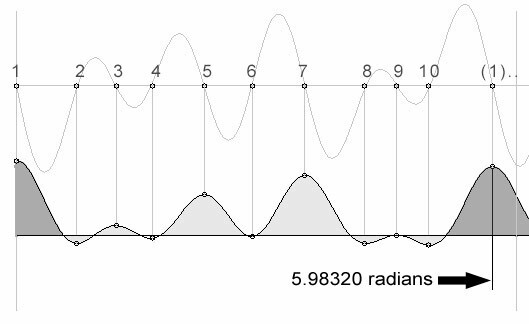 The resultant field or wave shape is plotted against the fundamental or hidden cycle. The sum total power yields a "2 theta" resonant mode: the fully computable solution of a new, synchronized path integral. In the low energy state, 3 of the 4 scalar fields have been "consumed" by the intermediate vector bosons, producing one extra spin each, and mass. The idea is that every natural system constitutes a mix of high- and low energy states, continually poised at the edge of equilibrium, and this is precisely what the synchronized state represents. The remaining "neutral" scalar field, i.e. the unchanged portion which is not involved in external interactions, is the hidden, fundamental or principal cycle or mode of the synchronized groundstate. Synchronizing the field: the causal matrix of axiomatic action potentials or "guna's"
"At very high energies this Higgs field fluctuates so much that you don't notice symmetry breaking" (G. 't Hooft). This state can be emulated by a computer but has not yet been decribed mathematically. In philosophy a similarly fundamental state is described as the "Tri-guna-atmika", the "triangle of forces" operating on the edge of equilibrium. P.R. Sarkar never explicitly used the term "guna's", which is mainly known as a philosophical concept, in connection to microvita theory. The "guna's" of philosophy exist however and might in a physics context be referred to e.g. as "fundamental stresses" or "axiomatic action potentials": confining (static), resonant (mutative) and radiant (sentient). Acting in unison, they form the ultimate operative principle of creation (phil. "Mulaprakrtii") and the formal synthesis of the synchronized groundstate. 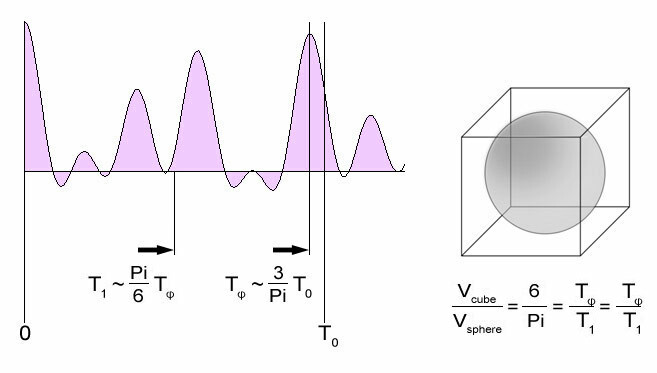 In other words, by axiomatically synthesizing, all THREE attributes of a wave (frequency, phase and wavelength), a consistent (and "complicated" - 't Hooft) vacuum is implied. This is exactly the function of the Causal Matrix, where "the three Forces encircle the Purusa" (Sarkar). 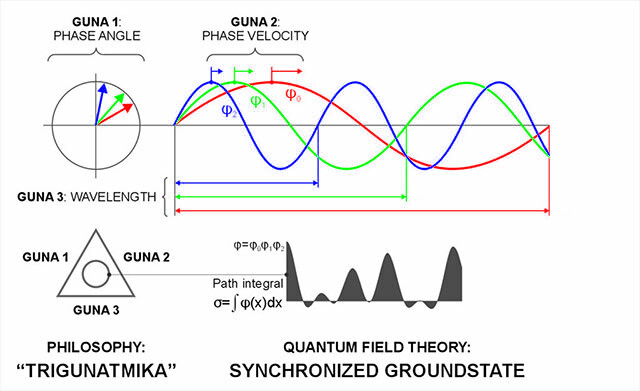 A relation between the "guna's" of philosophy and Quantum Field Theory could have interesting implications for both. By introducing the concept of a synchronized groundstate in QFT, continually balanced on the edge of symmetry breaking, certain fundamental issues in QFT such as the path integral problem or the mass gap problem could be addressed in a new way, be simplified or solved in the first place. A new type of boson? 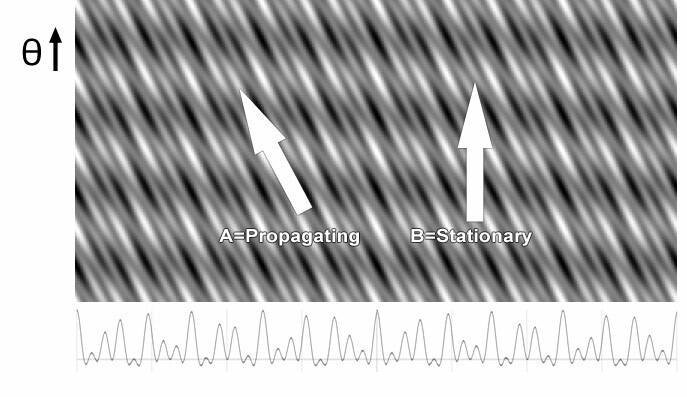 A "top-view" of the phasically evolving synchronized groundstate, showing two main oscillatiory modes. Light colors correspond to peaks, dark colors to troughs. It could be speculated that the "Propagating"
and "Stationary" types of boson correspond to "positive" (pro-mind) and "negative" (pro-matter) microvita. It is proposed that these GICP's closely corroborate a principal form of microvita. In terms of quantum physics, GICP's could possibly be referred to as a new type of boson, i.e. a force carrying particle - in this case a "synergetic force", possibly preserving a synergetic conservation law. A more or less direct volumetric implication of axiomatic guna logic was worked out by G. Srinivasan (Secret of Sankhya). The interactive resonance between the hidden and vacuum modes was referred to as Volumetric (or Vacuum) Harmonic Oscillator (VHO). 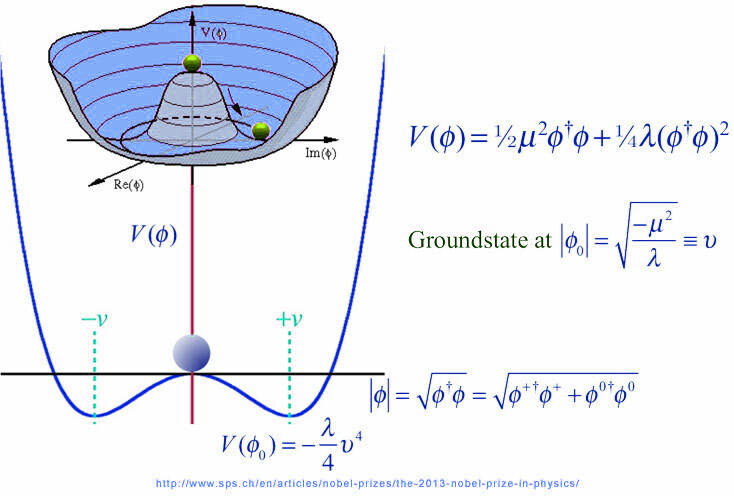 Srinivasan's approach however is not based on quantum field excitations. Note: the slight (0.3%) deviation of the axiomatically generated Pi (πaxiomatic. ≈ 1.00280π) might macrocosmically in fact account for the effect known as gravity.